If the kids’ toys are taking over the house then you could use these 10 tips to minimize kids toys. Even your kids can become more minimalist with a little guidance and encouragement. Here are some helpful pointers to reducing the amount of clutter and playthings through the house, and also making sure the kids are happy with the result too! 1. Find regular times to go through toys. This could be a few weeks before Christmas, holidays, or birthdays. If there is an occasion where your child knows they might receive some new toys, it might make it easier to clear some things out first. Maybe also at the change of season (outgrown bikes, sports equipment, etc). Or when you are removing your own items; make it a family task. 2. Notice what they play with, and remove items that are no longer used or enjoyed. If there are things that have clearly been tossed to the bottom of the toy box or are way below their age level, then it’s safe to say that those items can be cleared out. It goes without saying that broken toys should be removed and recycled or thrown out as the case requires. 3. Keep toys that are good for creative play. I find that there are some toys that stand the test of time. 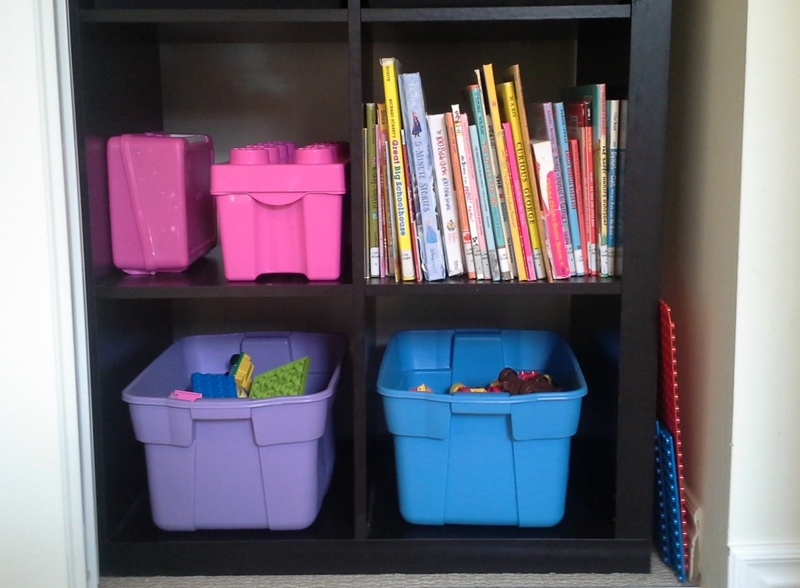 These include: building blocks, books, dress up clothes, arts and crafts supplies. There’s a reason why these toys stick around, and it’s because the kids can make new games with them over and over again. There isn’t one right way to play dress up, or one thing to build with a box full of blocks. These toys encourage your child to use their imagination and create their own new games every time they play. I’ve seen our Duplo blocks turn into airplanes, princess castles, bridges, pretend food items, animals, stairwells, a hospital, and more! This is the one toy that gets played with almost every single day in our house. 4. Keep toys that are easy to clean. As I mentioned, my kids’ favourite toys right now are the duplo blocks. It turns out they are also my favourite toys because they are very easy to clean. Every once in a while I can dump all of them in mesh bags and place them in the dishwasher to be cleaned. It’s super easy, they air-dry, and it reduces germs that the kids pass around! 5. Keep toys that can be donated when your child outgrows them. Books that your child has outgrown can be donated to a local library. Some places won’t accept stuffed toys as donations because they’re harder to clean. Wooden toys, blocks, or even toy cars and animals are easier to give to someone else later. 6. When it comes to minimizing and decluttering, be a good example. Kids will watch what you do and follow suit. Reflect on whether there are things that you’re holding onto but really don’t need, or if you hold onto things because of an emotional attachment or guilt. Kids pick up on so many things, and often what we do makes a bigger impression on them than what we say. 7. Let them be a part of the process. Unless it’s toys that they’ve obviously outgrown and don’t like, make sure they can be part of the process. Explain that when you donate toys, you’re giving another child a chance to use the toys again. I even bring my kids with me when I drop off donations at a centre for young moms. They were able to see the ‘play area’ where kids play, and they see how other kids are now able to use everything that we shared. 8. No guilt when they’re ready to let go of items. If they’re ready to part with something, listen to them. Okay, obviously they can’t give away all their pants or their prescription glasses. But really listen to them when they say they don’t want something. Be careful about saying things like, “But uncle so-and-so gave you that toy.” I sometimes wonder how attached kids actually are to things… and how much they learn or hear from us. Just be aware of this, and you might be surprised by how easily they can let go when you give them permission to do so. I mentioned in an earlier post that I had this observation about the TV too: Out of sight is out of mind. If you cycle some toys, they’ll probably forget about them and then show a renewed interest when they appear again. This will minimize kids toys by reducing how many are actually out at any giving time, but there is still a variety. Clean-up time is made easier by having less toys out in their playroom or bedroom too. This strategy can also be applied during holidays. For example, if you find that there are too many gifts during Christmas or birthdays, you can also ‘cycle’ some gifts; play with most of the favourite gifts right away, but put a few aside for later. The excitement will last for longer as they appreciate the new toys. 10. Ask for experiences instead of more toys. Ask family and friends to think about spending money on an experience for your child’s birthday instead of more physical toys. Unless your child really needs something, it can be nice to experience new things and go on outings. The wonderful thing is that when children are young, it’s especially easy to please them. When we were in Amsterdam, we got on a free ferry, rode it to the other coast, stayed on and came right back. The kids loved it – not unlike this girl’s ride on a train for her third birthday!. Check out this little girl’s sheer delight at watching a train pull into the station! If these points were helpful, you might also like 5 Tips To Minimize Kids Clothing.